.The First hotel is only 5 minutes drive from Tan Son Nhat international and domestic airport and 15 minutes drive from downtown Ho Chi Minh City and China Town ; which is the first stop on the way to all the big cities of Vietnam, Laos and Cambodia. * Complimentary buffet breakfast at Jacques Thermolle Restaurant on the ground floor. * Complimentary welcome fruit basket, flower and chocolate. 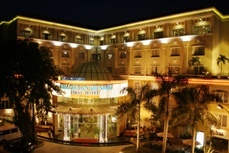 * Complimentary in-room tea & coffee, 02 bottles of mineral water per room /day. Child under 10 sharing bed with parents (without breakfast, limited to 01 child per room). * 01 free drink coupon at Veranda Coffee. * Check-in time: 2:00 PM. Check-out time: 12:00 noon. * Non-guaranteed reservation: room will be automatically released at 6:00 PM on the arrival day. * Late cancellation within 24 hours prior to the check-in date or no-show will be charged of one (1) night. Our 5 restaurants & bar present a world of dining and entertainment. Offering a large menu of Western and Asian favorities in a casual setting. Guests can stop by for a glass of wine or one of our expertly - mixed cocktails. First Grill Restaurant:An open air restaurant located by the pool side, offering a variety of seafood and Vietnamese specialties. Korea Restaurant- Ground Floor- An elegant restaurant offering customers a mouthwatering selection of Korean food and service with a smile. - Serving snack, beer, coffee and cocktails. Veranda Coffee Veranda Coffee-5th floor Bar-Enjoying a nice view, the 5th floor bar is where to rendez-vous for intimate gatherings with hot and cold beverages and snooker. With seating for 30 persons, our A & B meeting rooms have warm and intimate ambiance that makes them ideal venues for various choices of small meetings and seminars. 7 function rooms accommodating up to 700 persons - specialized in organizing conference, reception, cocktail and buffet banquets, etc. *Stand Microphones & Table Microphones & Wireless Microphones.